Lola argues that, in her opinion, pink is just pale red and Bella argues that, in her opinion, soccer is boring; and, except that they both speak Spanish, there are few things that the two have in common. Will they ever get along? When an accident occurs—involving an explosion of black dye that ruins everyone’s clothing—the moms get involved and, with Principal Blot’s blessing, the two girls are forced to switch roles: while Bella engages in soccer drills (in which she excels), Lola puts on “weird clothes” and attends ballet practice (in which she is definitely “not horrible”). Bella and I take a look, and that’s when I see Ben. He’s leaping, spinning, and dancing around the lobby. He must have been watching the ballet class very closely through the window, because he seems almost good at it. When the ballet coach remarks to mom about Ben’s natural talent, both plant the seed and give Ben space and time to think about becoming a ballet dancer. “OK,” he says. Dominguez’s grayscale interior illustrations, begun with loose pencil sketches and digitally finalized, beautifully maintain the ethnic similarities and differences within Lola’s own family and among her friends, teachers, and schoolmates. But her cover art—just wow! Rendered in pencil with tissue paper on illustration board and finished with digital color, here are Lola and Bella, standing back-to-back, facing the reader and slightly turned toward each other, smiling widely. Bella is wearing a pink ballerina outfit and holding a soccer ball, while Lola is wearing a pink tutu over her soccer uniform. Here are two Latina children—one Peruvian and one Mexican. They have different skin tones and different facial features and are not, in any way, caricatured. How rare and real and beautiful and affirming is that? 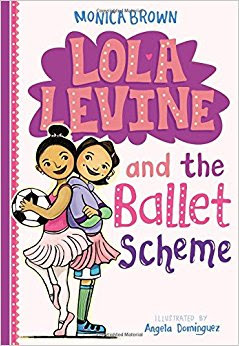 Lola Levine and the Ballet Scheme is an easy-to-read, smart, funny and affirming story that challenges socially established gender roles in an age-specific way that will especially resonate with young readers who feel—or actually are—marginalized by these norms. It’s not only a typically fast-paced “Lola” story but an important one as well. It’s highly recommended.